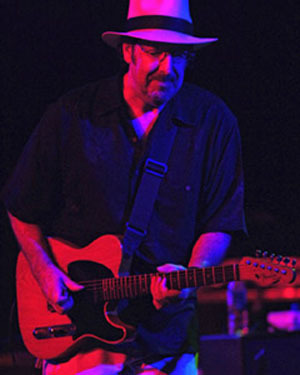 Tom Principato has spent the last 40+ years as a guitarist and singer based in his hometown of Washington, D.C. In the 1970's, Tom was leader of the legendary band Powerhouse, an East Coast phenomenem who released an album "Night Life" to critical acclaim. Tom also did a one year stint with Geoff Muldaur and recorded an album "I Ain't Drunk" (Hannibal/Island Records 1980) with the band Geoff Muldaur and His Bad Feet members of which included Andy Stein (Asleep At The Wheel), Mark Kazanoff (Earl King) and Sarah Brown (Lou Ann Barton). Tom has also done brief stints with various acts including Billy Price And The Keystone Rhythm Band, Big Mama Thornton, Sunnyland Slim, James Montgomery, and a group called The Assassins with Jimmy Thackery, former guiatrist with The Nighthawks. Tom appears on two albums with the Assassins, "No Previous Record" (1986) and "Partners In Crime" (1987) which won a "Wammy Award". In 1984 Tom began a solo career, notably recording a live album with the late Washington guitar legend Danny Gatton titled "Blazing Telecasters". This album was considered by The National Academy Of Recorded Arts And Sciences (NARAS) for a Grammy Nomination. The band has toured clubs and festivals extensively in the U.S., Canada, and Europe including Norway, Sweden, Germany, Belgium, Holland, Switzerland, Austria, France, Slovenia, Finland, Italy, Sardegna, Corsica, Spain, Portugal, Majorca, Menorca, St. Croix, and even Greece and Turkey! Tom's 1992 Recording "Tip Of The Iceberg" was co-produced by Chuck Leavell, a keyboard player who has played with Eric Clapton, George Harrison, The Rolling Stones, The Allman Brothers Band, and Sea Level. Chuck also appears on Tom's "Really Blue" CD. In 1995 Tom's song "In The Clouds" was considered for another Grammy nomination.